Males are bright blue with yellow/ along the lower body. The tail is blue with yellow lines mixed with it. Some males start out mostly darker blue, then show yellow on the tail and body. Females are cream with brown stripes. A few females have black stripes rather than brown ones. Males are slow to color and dominant males will not let sub-dominate males color. Most males do not show full color until 3.5 to 4"
Last, grow out count 04/18/2098. Next, grow out count due 05/10/2019. Grow out counts are counts of the fish in stock checking for additional males and increases in size. 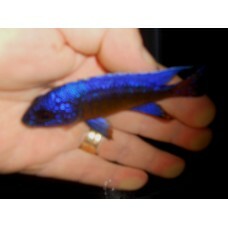 I am working with a small breeder group and may occasionally have a few of these fish due to their demand. Watch for more on the special order lists. 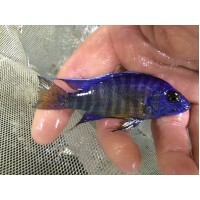 Best kept in breeding groups, Single males may work in a mix group tank with milder peacocks and haps. 55-gallon or larger tank recommended.